I bought a vape stick in December 2015 to curb my social smoking habit. The result? Zero cigarettes smoked in 2016. But even though vape pens appear to be a much, much safer alternative to smoking, I now have a far more significant relationship with nicotine. One problem fixed, another problem pops up. Chrono Therapeutic's upcoming SmartStop patch is designed to be a way to quit smoking without risking diving further into nicotine dependency. It's a reimagining of today's nicotine patches. The first obvious question: what's wrong with normal nicotine patches? Many of you may be well versed in nicotine patch use already; they are little patches you stick on (usually) your arm. They'll deliver nicotine for around 24 hours before needing to be replaced. One existing issue is how quickly the patches work. Put a patch on in the morning and it won't start delivering nicotine quickly enough to combat killer morning cravings. Apply one before you go to bed and the nicotine can spoil your sleep and give you pretty wild dreams. Professor Robert West of University College London's department of epidemiology and public health says that with "a wearable transdermal nicotine delivery device the absorption of nicotine is generally very slow. "So [Chrono Therapeutics] will have to have found a way of getting much more rapid nicotine delivery through that route than has been achieved by transdermal products so far." The SmartStop patch's fundamental change is that it regulates nicotine delivery. It's a "wearable device that delivers nicotine when people have peak cravings", says Chrono Therapeutics's vice president of business development David Matly. "About 90 minutes before the user wakes up the device starts delivering nicotine" because "80% of smokers have their first cigarette within 30 minutes of waking," Matly told us. The device then ramps-up nicotine before lunch, because quitting smokers tend to get "intense cravings at meal times — you eat, and you metabolise more quickly." The SmartStop increases nicotine delivery once again in the evening to deal with the "social cues" that make you want to smoke. We'll take that to mean dealing with the nightmare cravings you can get in the pub after a drink or two: the breaking point of most people we know who have tried to quit smoking. Hardware-wise, the SmartStop looks like the device's elevator pitch made real: a techy nicotine patch. It comes in two parts. There's a liquid nicotine cartridge, which you replace each day and stick to your arm or leg like a normal patch, and a control unit, which is the brains of the operation. The control unit, in which the Bluetooth chipset, battery and dispensing motor live, slots into the sticky patch. This module's battery is designed to last for the full 10 weeks of a Chrono Therapeutics plan. Look at the rendered images available so far and your first reaction will probably be that it looks very large. It is, particularly compared with a normal nicotine patch, at 13mm thick. However, it is small enough to slip under clothing, weighs "less than an ounce" and Matly says the team is "working on a gen. 2 model that's down to 8mm" in thickness. The first generation already has the basics down, with waterproofing strong enough to let you wear the smart patch in the shower. Its aim is to kill your nicotine dependency in just 10 weeks. "It's a step-down programme – for the first six weeks you're on the high dose, then the next two weeks you're on 14mg, then the last two weeks on the 7mg dose. Then you're weaned off of nicotine," says Matly. That makes it sound all-too simple, but Chrono Therapeutics recognises it's only half of the story. "You have to address the psychological and behavioural," Chrono's VP adds. This is where the software side comes in. 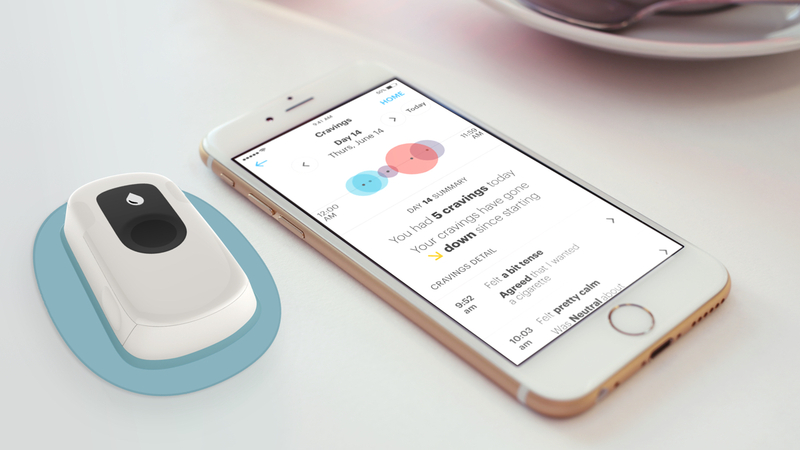 The wearable communicates with a smartphone app using Bluetooth, and aside from letting you record your sleep and wake-up times to work out when to start administering nicotine, you use it to log cravings. There's a button on the device to let you quickly note a craving, and you can add more details in the app. Over the weeks you will, with any luck, be able to see the frequency of those cravings drop off. You need to feel like you're getting somewhere, after all. One of the most important tools in Chrono Therapeutics's arsenal, though, is something that might make you horrified at first: guilt. On starting the 10-week programme you can record a video emoting into your phone camera about how you want to quite smoking to see your kids grow up, and the app will show you it when you're about to give in. Friends, family and even your social networks can be linked to your account too, and are alerted should you stop using the wearable. This may seem invasive, but that's the idea. And you opted in, anyway. "We will remind you, show you your video, show you pictures of your children, remind you why you're quitting," says Matly. Despite its results-driven approach, there's a personal tale behind Chrono Therapeutics. It was formed in 2014 after Wall Street corporate lawyer Guy DiPierro's mother died of smoking-related lung cancer. He gave up his job to try to find a better solution for smokers wanting to quit, and found a nascent version of this drug-dispensing technology in the works at a university lab. If you've used patches and gum without much success, though, there is still a wait to try out the Chrono Therapeutics wearable. It is currently being trialled in the US and Australia, with over 500 users to date, and in 2017 will be tested as part of a clinical trial of 400 smokers, pitting it against non-smart nicotine patches. Chrono Therapeutics has amassed over $80 million in funding since 2014, and expects to see the SmartStop used more widely in 2018 or 2019. The basics of the drug-dispensing technology are also being investigated for use by Parkinson's, opioid addiction and chronic pain sufferers but the focus for now is smokers. "Patches have been around for 30 years, they sell in the billions of dollars, and they don't work," Matly says. But he hopes to be able to achieve quit rates of "over 50%," factoring in full behavioural support via the app. Quitting smoking was never going to be easy.